Table Tennis has once again dominated the GLL Sport Foundation Athlete of the Month award. Tin-Tin Ho from Westminster has had a fantastic February winning the Nottingham Grand Prix at the end of January and picking up a SPOTY award and presenting at another prestigious ceremony. At the Nottingham Grand Prix Tin-Tin won the Women Band One Singles, U21 Women’s Singles and was a semi-finalist in the Women’s Open Singles. Winning both her age categories and reaching the semi-finalist in the senior age category is a fantastic result. 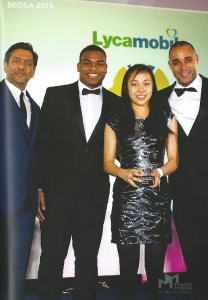 Away from the Table Tennis table, Tin-Tin presented awards at the British Ethnic Diversity Sports Awards (BEDSA) and won Canary Wharf Sports Personality of the Year 2015. The BEDSAs are designed to recognise and celebrate the contributions made by black and minority ethnic communities. The Awards will help drive change in the sport sector where more role models from more communities in more sports are a priority to increase participation. The recognition of hard work and dedication stimulates interest and unearths talent on and off the field of play. The BEDSA 2016 awards took place at Grosvenor House of Park Lane, Mayfair and Tin-Tin was involved in the presentation of the prizes – fantastic recognition! You can view more information about the BEDSAs here. 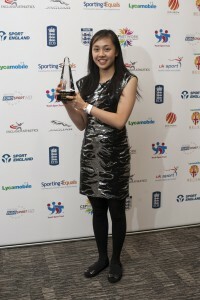 The Canary Wharf Sports Personality Awards took place on Thursday 11th February at the East Wintergarden. The awards celebrate high-achieving athletes, sports clubs and administrators from the East End of London over the past 12 months and was by attended by special sporting guests along with a host of local dignitaries. There was stiff competition, with another GLL Sport Foundation supported athlete Olivia Piechota representing Judo, also in the running. Congratulations to Tin-Tin who ended up coming out on top, a well deserved winner! You can view more information about the Canary Wharf SPOTY Awards here. Congratulations to Tin-Tin for winning the February Athlete of the Month. Good luck to all athletes these March – we look forward to our next selection!